Dr. Benest participated in The Skin Cancer Foundation's Destination: Healthy Skin program yesterday in Burbank (along with the Rams cheerleaders)! The Foundation's RV is traveling around the country providing education and free skin cancer screenings with the help of local volunteer dermatologists. Visit DestinationHealthySkin.org for a list of events and locations. 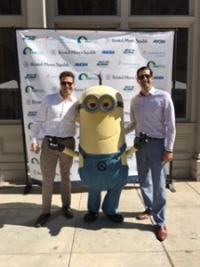 At the annual Miles for Melanoma race at Universal Studios, Dr. Larian and Dr. Bibi joined the event and offered free skin checks to people in attendance. As an experienced and proven Dermatologist, Lisa Benest has offered her expertise to numerous media sources. Her credentials have made her a trusted authority regarding Cosmetic and Medical Dermatology. View some of her media appearances and contributions to publications below. Dr. Lisa Benest proclaimed - "Best Wrinkle Remover"
Read article in our "Articles" section.